Preheat oven to 350 degrees F (175 degrees C). Lightly butter an 8x8 inch baking pan. Line bottom of pan with bread cubes. In a large bowl, beat together eggs, milk, 2 tablespoons sugar, salt and vanilla. pour egg mixture over bread. Dot with margarine; let stand for 10 minutes. 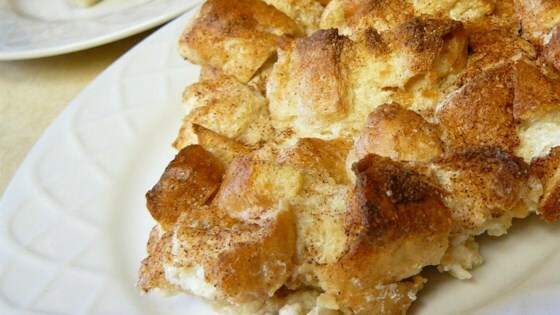 Combine remaining 2 tablespoons sugar with 1 teaspoon cinnamon and sprinkle over the top. Bake in preheated oven about 45 to 50 minutes, until top is golden. Fabulous! Definitely a hit with the kids. I've made this several times and it is so easy. A few times I have used the King's Hawaiian rolls and refrigerated overnight before cooking. YUMMY!